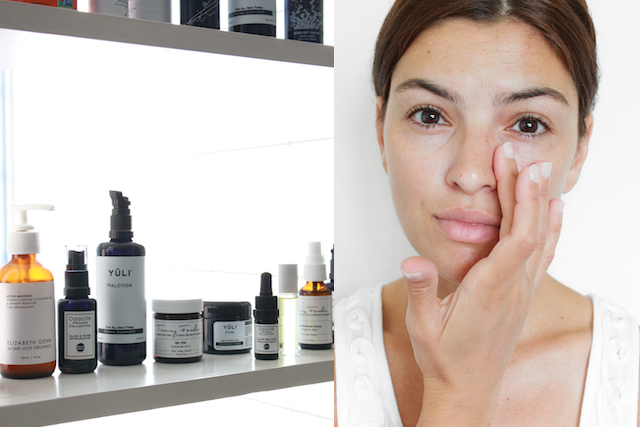 It’s been a while since I wrote my last skincare update (almost one year, you guys! ), but I didn’t have anything new to share until recently. I kept using the same exact three products (with the exception of a couple of different masks) and my skin did well for the entire time. I don’t remember going through any breakouts at all, and I only had one horrible skin rash when I went out of town and brought different products with me (I wrote about that episode in this post). After healing from that rash I went back to my minimal routine, and my skin has been doing great ever since. Here’s what is currently on my top shelf, and what I have been using lately. I cleanse my face with the YULI Skincare Halcyon Cleanser after my morning workout. This cleanser is a product I try to never be without because it cleanses the skin deeply without stripping it at all. It has a light, gel-like consistency (more runny than a gel) that lathers ever so slightly when in contact with water and rinses off leaving no pore-clogging residue on the skin. It is one of the few products that I have been using consistently for the past year, and unless you have very dry skin, I highly recommend trying it (full review here). I follow with a face mist which is usually the Yuli Cocoon Facial Elixir (full review here). The combination of soothing, plant-based ingredients like Chamomile and Calendula is absolutely magical for my skin. However, recently I have been using the Odacite + Moon Juice Face Mist that comes in the Clair De Lune set*. The formula is very simple, it contains only Aloe Vera juice and Rose Water, but it leaves my skin feeling hydrated and non-greasy. After spritzing my face with one of these two mists I either apply face sunscreen or I just move on to makeup. The two face sunscreens that I have been using the most are the Suntegrity Unscented Body Sunscreen (yes it’s for the body, but it works fine for the face, too), which I use when I need heavy duty sun protection (beach, outdoor workout), and the Coola SPF 30 Matte Finish Cucumber Sunscreen, which leaves a bit of a white cast but it is perfect under makeup because it has a silky finish. At this time, I am not using any other moisturizer/treatment in the daytime because my skin does better without it. Since Summer arrived, every time I tried to use some oil or moisturizer during the day I ended up with clogged pores (sweat, oil, and moisturizer don’t mix well together!). In case you are new to my blog, I have normal-oily skin and live in sunny, humid, Florida. One thing I have learned since I started testing and evaluating skincare products for Genuine Glow is that no one’s skin is exactly like another’s and now I know that I no longer have to layer loads of product just because it is recommended by skincare experts. This is what has been working for my skin and I am sticking to it. I bought so many products (that I only used once or twice, such as acid-based masks) because I felt like I had to use that specific treatment or mask in order to get “the skin I wanted”. I encourage you to listen to your skin more than you listen to any blogger/expert when it comes to building your skincare routine. 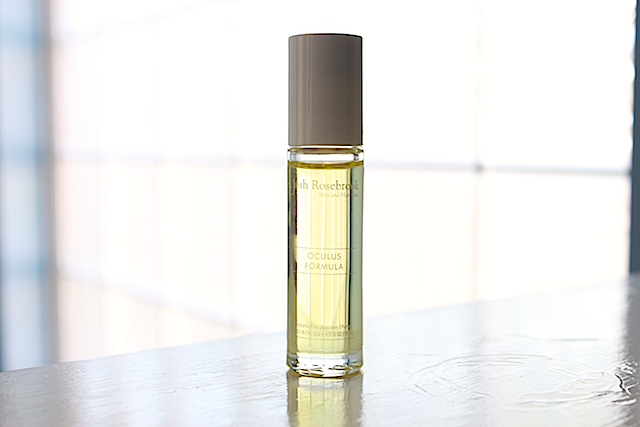 On days that I wear makeup, or when I need a deep cleanse, I reach for the ED4OLO Cleansing Oil (full review here). This has been my go-to makeup remover for a very long time because it removes every single bit of makeup (even waterproof) and it comes off easily, which is not the case for most cleansing oils. 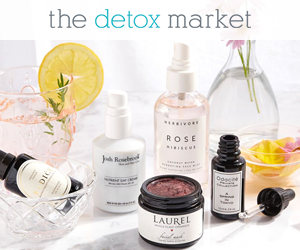 I do my first cleanse with this oil and then I do a second cleanse with the Yuli Halcyon Cleanser, which removes the last bits of everything. Then, as I do in the morning, I spritz my face with a mist (one of the two mentioned for the AM routine), and then I apply a serum. 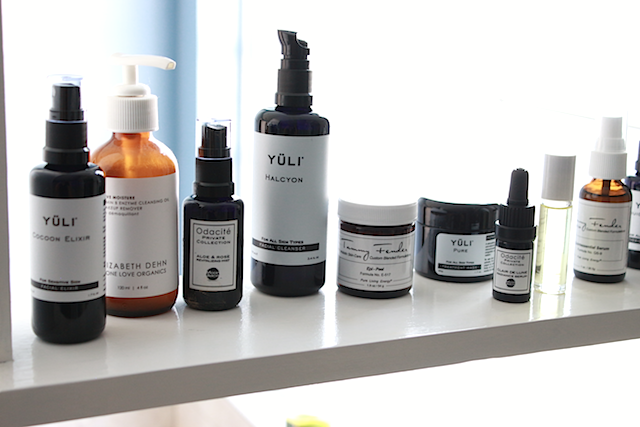 During the past few months I used the YULI Liquid Courage Antioxidant Serum (full review here), but last month I used the Odacite+ Moon Juice Face Serum that comes in the Private Collection Claire de Lune skincare set* and I loved it. It has a thicker consistency than most serums I have tried (like a high viscosity oil), but it absorbs so so well and so quickly leaving no greasiness on the skin at all. I think that it would suit most skin types because it moisturizes and softens the skin, but it does not exacerbate oiliness. This serum is on my list of products to repurchase as soon as I have tested out a few other samples, because it is really that good for my skin. (Full review coming soon). The newest addition to my routine is the Tammy Fender Quintessential Serum*. I have only been using it for less than two weeks, but I am liking it so far. It is very rich in texture and very emollient but it does not clog my pores. I have been using it every night and since then I have woken up with smooth, glowing skin. I have been doing masks quite often during the past year and I believe that they have significantly helped, especially on hormonal days. I like to use masks that contain non-harsh, purifying clays because I need deep cleansing to clear out my pores, but my skin is delicate. Some clay masks are way too harsh for me and leave my skin irritated. Currently my favorite face mask is Yuli Pure. It effectively purifies my skin, giving me a deep cleanse and the most gentle, non physical exfoliation. I reach for it every time that my skin starts to look congested and it has never failed me. When I see a few tiny spots starting to form (usually during my PMS time) I will use it for two days in a row, at night, after cleansing with Halcyon. I cleanse first with Halcyon as I normally would, then I mix a few drops of cleanser with a teaspoon of mask. This combo makes a smooth, gel-like paste that applies easily and rinses off clear. It makes my skin feel and look like a million bucks, and it clears out the skin from any of the blemishes that were trying to pop up. Another mask that I have recently started to use is the Tammy Fender Epi-Peel*. The consistency of this mask is similar to toothpaste, smells quite herbal, and gives the slightest tingling to my skin, but it does not leave my skin irritated. Although it contains micro-particles to provide the slightest physical exfoliation, it rinses off clear so no residue is left on the skin to clog the pores. I have enjoyed so far, and will keep you posted about it after I have used it for a little longer. I think that this would work for everyone looking for an exfoliating product that is not harsh, however I would not recommend it if you have broken or sensitive skin. Besides my all-time favorite eye cream from Pai Skincare (full review here), I have been using the Josh Rosebrook Oculus Formula* at night for some time. It is a light eye serum that comes in a glass tube with a metal rollerball applicator, which feels very soothing on the under eye area. It contains great moisturizing plant oils and a few essential oils, and the essential oils have not caused any trouble. I just sweep it very lightly under my eye without getting too close to the lashes and then pat the area gently. As you may have noticed I use a significantly lower number of products compared to the past, and even though I have several products sitting on my other shelves waiting for me to try them I have accepted the fact that my skin has become more delicate over the years, and that I need to be very gentle and introduce only one new item at a time. What’s on your topshelf? Have any skincare products ever got you frustrated because you wanted them to work for you like they did for others, but they did not?